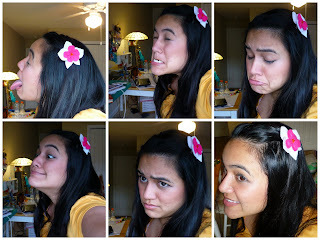 I decided to make something quickie today and made these little felt flower barrettes. This one is supposed to look a little like an orchid. They are really easy to make. I aughta post a tute one of these days. Here are some action shots. I couldn't seem to get the right face to show it off, so here are several.